Bloxels is a hands-on platform where the children get to design, build and play their own video games. The children create the background and characters using the blocks and the board. They then scan the board with an iPad, where they can see their creations come to life. This set is based on the latest science standards and was created to enhance students' curiosity and science skills. The children build their own robots following the instructions on the iPad. Then, once they are finished the build, they programme the robot to move and complete different tasks. The different projects on the app are linked directly with the Primary Curriculum. Bee-Bots are exciting little robots designed for use by young children. They are the perfect introduction to programming. These easy-to-operate, and friendly robots are a perfect tool for teaching directionality, sequencing, estimation, problem-solving, and just having fun! The children use the arrow keys to code Bee-Bot to move and turn. Minecraft: Education Edition is a collaborative and versatile platform that we use across subjects to encourage 21st-century skills. The children create their own characters and then build different landscapes. A number of different projects have been completed on Minecraft including the Antarctic project, where the children built the Antarctic. With Scratch, you can program your own interactive stories, games, and animations. Scratch helps the children learn to think creatively, reason systematically, and work collaboratively — essential skills for life in the 21st century. Green screens are used in the movies to make it look like the actors are driving across the desert, and it's used on TV to make it look like your local news announcer is standing in front of an animated weather map. It is easy and fun to use green screens in the classroom. The children use the green screen to get into character and create different scenes. The children can go into role as a News broadcaster at different events in history or pretend they are in a different country. They can use their imagination to explore what they have learned in the classroom and make a video, showcasing it. The maker space is a station where the children are given a task and asked to build different structures using the resources they have available. The children use innovative and collaborative thinking to build the different structures. It helps develop their construction skills and cognitive thinking. The Makey Makey allows the children to connect everyday objects to computer programs. Using a circuit board, alligator clips, and a USB cable, the kit uses closed loop electrical signals to send the computer either a keyboard stroke or mouse click signal. This function allows the Makey Makey to work with any computer program or webpage since all computer programs and webpages take keyboard and mouse click inputs. 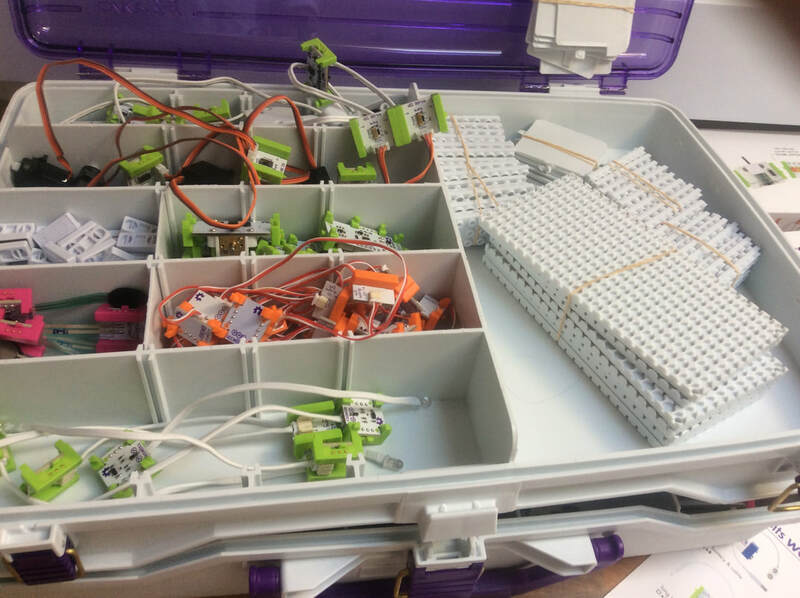 Little bits are the new, innovative way to teacher circuits in the classroom. The children are given a task card and are asked to create different circuits and objects. This station can be linked with the maker space, where the children build something and then add the little bits to bring it to life.